Keratoconus is a condition where the collagen of the cornea is weaker than normal, resulting in its stretching and deformation by forces such as pressure inside the eyeball, which may increase with actions like eye rubbing. 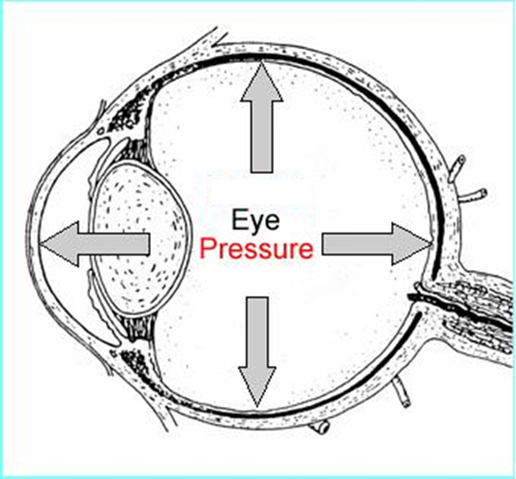 The eye is rather like a balloon or car tyre, and has a pressure to keep its shape. But if there is a weakness somewhere, the pressure can 'blow' out that weak area and cause it to protrude. Patients with keratoconus usually are diagnosed in their teenage years or in their twenties. For many, the first sign of an eye problem is when blurry vision cannot be fully corrected with glasses. 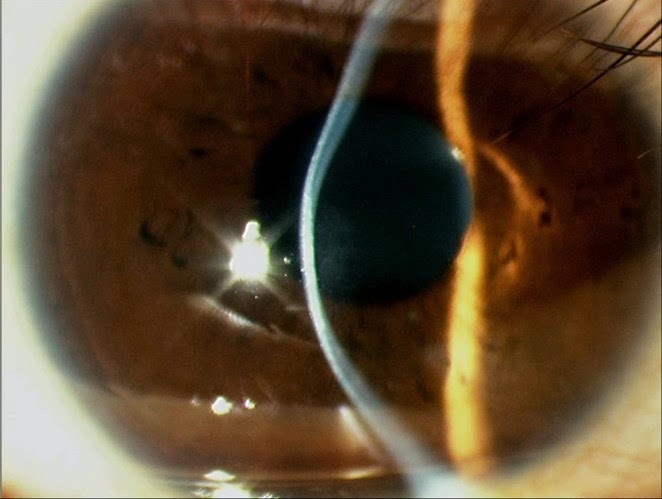 Traditionally, the treatment of keratoconus was optical (making vision clearer with glasses or rigid gas permeable contact lenses), until the condition became very serious, in which case corneal transplantation would be needed. Besides causing very blurred vision, advanced keratoconus can cause corneal scarring, and occasionally the stretched Descemet's membrane tears resulting in a condition called hydrops where the cornea suddenly swells and becomes very hazy. Since keratoconus is associated with a weakness of the cornea, a logical remedy would involve strengthening the cornea. A way to do this only became available relatively recently, and this treatment is called 'corneal collagen crosslinking'. Many things around us are made of long chains of atoms, such as rubber, leather, and even our own hair. Our corneas are made of many layers of collagen stacked one above the other. The process of crosslinking is used all the time, from vulcanizing rubber to make into car tyres, to tanning leather, to perming our hair. Our corneas can also be crosslinked to make them stiffer. How is corneal crosslinking done? Crosslinking can be achieved in many ways, but one reason it took so long to discover a way to crosslink the cornea was that most of the methods are toxic and damaging to living tissue. Take formaldehyde for example. This chemical crosslinks tissue in the process of embalming/preservation of dead tissue, but would severely damage live tissue. 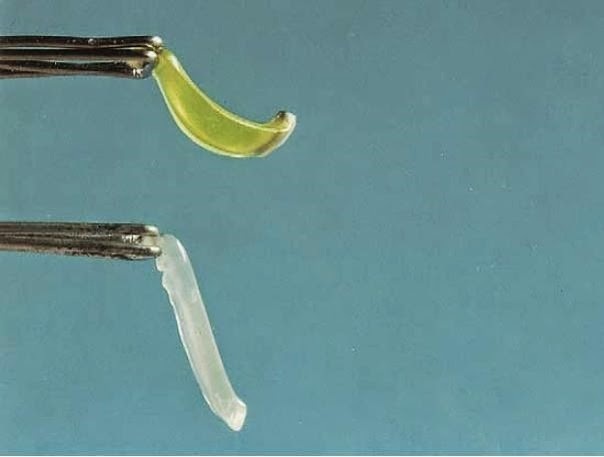 Finally, in the late 90s and early 2000s, Wollensak and Seiler described a way to crosslink the cornea using vitamin B2 (riboflavin) and ultraviolet light. The cornea was soaked with riboflavin for 30 minutes, and then ultraviolet light was shone onto the cornea for another 30 minutes. This process successfully stiffened the cornea by about 4 times, and provided the cornea was carefully screened to ensure enough thickness, proved to be a very safe procedure. Recent data suggests it is effective, with a 10 year study showing that only 2 of 34 eyes required repeat crosslinking at 5 and 10 years after the original procedure. J Cataract Refract Surg. 2015 Jan;41(1):41-6. doi: 10.1016/j.jcrs.2014.09.033. The majority of eyes in fact showed mild corneal flattening after the corneal crosslinking treatment. However, the main aim of this procedure is to stabilise the condition, and for most patients there is no significant change in the spectacle power. Nowadays, 'accelerated crosslinking' using higher ultraviolet light energies is available, and this improves patient comfort by making the procedure shorter. Accelerated crosslinking generally soaks the cornea for 10 minutes, followed by ultraviolet light for 4 minutes. Unfortunately, some cases of keratoconus continue to be diagnosed at a late stage. The condition can be difficult to pick up in the early stages, because there are no obvious corneal signs and vision may be correctable with normal spectacles. The diagnostic equipment of choice, a corneal topographer, is also not universally available in every eye clinic. 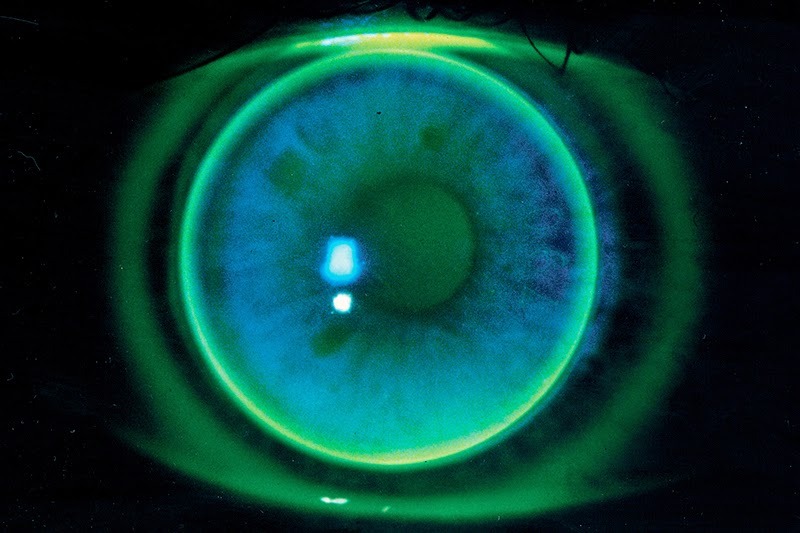 In advanced cases, the cornea is often too thin to allow safe crosslinking, and also too distorted to allow comfortable wearing of contact lenses. Some cases have scarring resulting from a very advanced cone or from previous hydrops. In such cases, the treatment of choice is a corneal transplant. Although a relatively big operation for the eye, corneal transplants traditionally do very well in keratoconic eyes. These eyes are uninflamed, not vascularized, and the grafts can survive for decades. 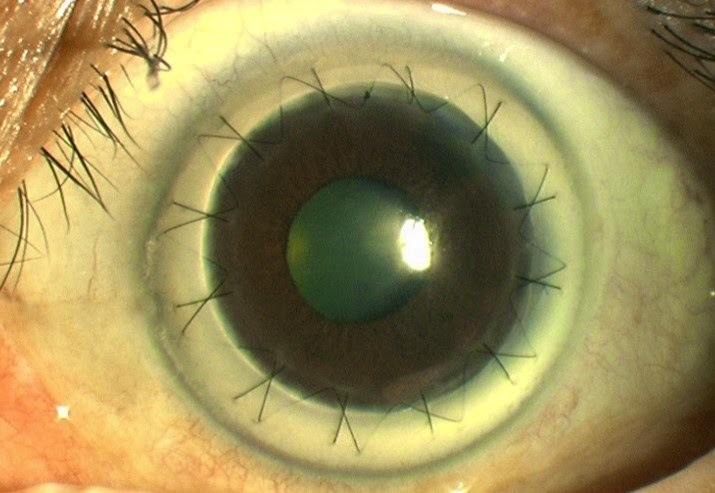 Nowadays, partial thickness corneal transplants (deep anterior lamellar keratoplasty-DALK) are performed wherever possible, thus avoiding serious endothelial rejection episodes. Such grafts could well survive indefinitely (while the patient lives). There is actually a method of trying to regularize the corneal shape by implanting curved ring segments of a special plastic called PMMA into the cornea (IntraCorneal Ring Segments). This method works by flattening the middle part of the cornea, and was originally used to treat shortsightedness. However, once LASIK and other excimer laser procedures came into being, this procedure was abandoned for shortsightedness. Partly it was due to the reduced accuracy of treatments when compared with LASIK, but partly it was also because many patients who had these implants developed deposits of a whitish material within the cornea after some years. I haven't found a good reason for using this method of treatment at this time, but will continue to monitor studies on this. 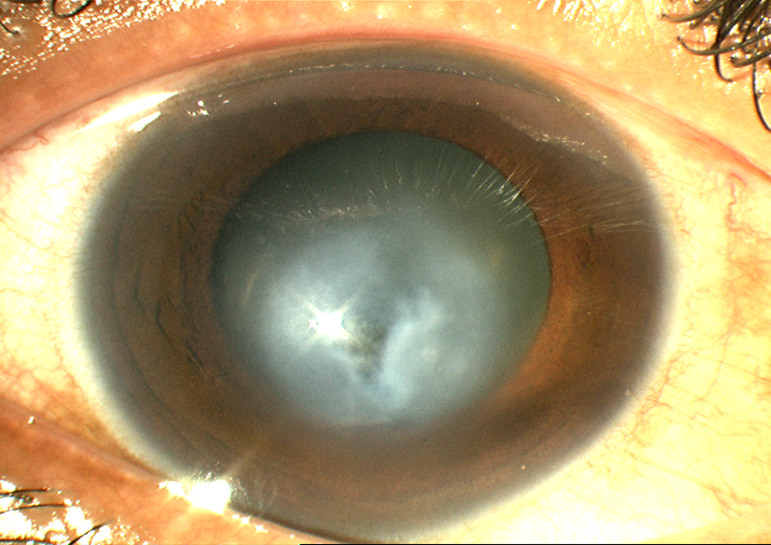 Usually those patients having less severe keratoconus can be fitted with either RGP contact lenses or semiscleral lenses, and the more advanced cases would benefit from a corneal graft. So, keratoconus-an old condition, but patients are getting better options to improve their vision, and finally (! ), an option to actually address the condition at its root cause. Current treatment options for corneal ectasia.Tan DT, Por YM. Curr Opin Ophthalmol. 2007 Jul;18(4):284-9. Review.